"Our pupils experienced a fun, fast-moving ad educational show. We had an audience which included all ages from year 7-11 and with the level of French varying from simple to reasonably difficult, all ages were able to benefit at their level. It was wonderful to see so much audience participation and the performance concluded with rapturous applause both for the actors and the participants! I hope we will have the pleasure in welcoming the Dreampark Theatre company to our school again in the future." "Students of the 'V-K-K' enjoyed watching plays of L.P.C. Last year's production of 'The Woman in Black' was an extraordinary performance. The intensive play of the actors and the imaginative sound arrangement made it an exciting and thrilling experience. We are looking forward to this year's play." "For the past 15 years, our school has hosted L.P.C. regularly. The response of students and teachers has been overwhelmingly positive. The opportunity to experience English theatre live and in the comfort of your own school is well worth the price, and the talented and personable young actors invariably succeed in establishing a close rapport with their audience." 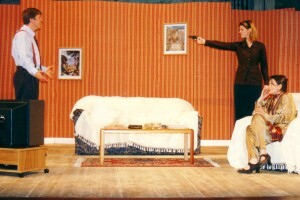 "The London production company gave a memorable performance of Une Journée sur la Côte d'Azur in November 08. This is the second visit of the theatre company to the school and we would invite them back again. They are a compact theatre troupe who nevertheless manage to inhabit and portray a variety of convincing roles. Their productions are a refreshing and engaging mix of visuals, music and minimalist but innovative props breathing life into a journey which all the students enjoyed from start to finish, not least as there was the excitement of audience participation. We were taken to train stations, markets, circuses and more. As a teacher I was impressed by the authenticity of the language situations created and by the range of productive language generated with all the constructions one would expect and jokes that the students could understand, all woven in seamlessly. Teenagers are notoriously difficult to please but the performance caught and retained the attention of a couple of hundred boys and girls spanning years 10 to13. The whole was very clearly articulated, without being cluttered and always with humour. Our visiting schools Varndean and Patcham High found the performance instructive, surreal and good fun. On a practical note, the company are prompt, efficient and reliable. They are strongly recommended." 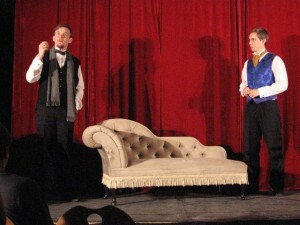 "French lessons took on a dramatic twist at King William's College with a performance by the London Production Company. A performance in French of Une Journée sur la Côte d'Azur was staged for students from lower four to upper five (years 7 to 11) recently. The play was set in both Cannes and Nice on the French Riviera, and revolves around a young girl frantically searching for a friend's dog, called Fifi. It was designed to improve students' understanding of the language through a medium other than traditional classroom teaching. The eight acts of the play were set through a slideshow and some French music. 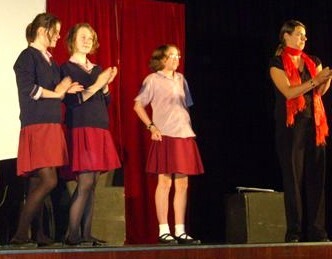 The three comedians in the play spoke only French, but the actions and costumes assisted the students with their understanding of the play. At times, students were asked to answer questions in French or to play a part on stage to the great amusement of their peers. Drama aids the understanding of other languages and cultures and contributes to an all-round education, and it's really fascinating to see this in practice"
"A few words to thank you for all the plays we have enjoyed watching for the last 20 years. There was always a lot to learn for the pupils before the play and when the day of the performance came, there was a lot of pleasure and discovering for everyone. We particularly enjoyed the time offered for talking with the pupils, at the end of the play"
"L P C has been coming to Monaco every year for about 12 years.They have performed plays by H.Pinter, S.Hill, R.L.Stevenson, A.Ayckbourn among others.We are very happy with their shows and their excellent acting. It's definitely an enriching experience for our students who look forward to their coming every year." "Some 1,500 students and I have seen the shows for more than 15 years now, here in Charleville-Mezieres. My European class students now experience it every year in our school, and they enjoy it more and more. They talk with the actors, producer and director and find it self-rewarding as far as their English skills are concerned. It is a lively and enriching experience both for the students and teachers as it is also an opportunity to use English in a different way from more traditional class work and it also broadens horizons. Some students even discover what drama really is and what acting is about. In brief, a successful experience and always a good-quality show, easy to be set up in a school"